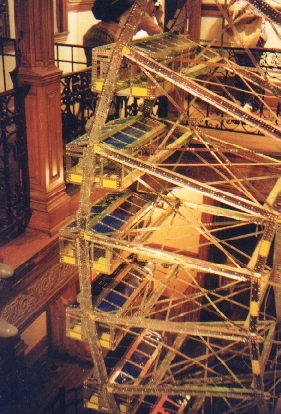 Above: The original 1893 wheel built by George Ferris at the World Colombian Exposition at Chicago. The World's Fair, as it would later come to be known, was so well attended that additional hotels in Chicago and housing were built to accommodate the employees, their families and tourists. The original wheel was a huge success; literally, the wheel was 250 feet in diameter. There were 36 gondolas which were loaded 6 at a time. Each gondola was 27 feet long, 9 feet high and 13 feet wide. Try to imagine! The original wheel was so big, its height was equal to the height of many hotels. In fact, Dearborn Station, an old railway building located in Chicago, is exactly 250 feet tall. That's 1/5th the size of the Sears Tower! Right: A view of the gondolas from the second floor balcony. This gives some idea of the scale of the model. The model has been recently restored by Ripley's and is now fully operational. It is the largest mobile Meccano/Erector model in the world, Believe it or Not! 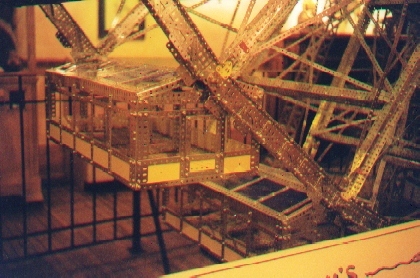 The model was originally built by Meccano S.A. in France. It was shipped to the United States to promote the Company after they bought out the "Erector" trade name. 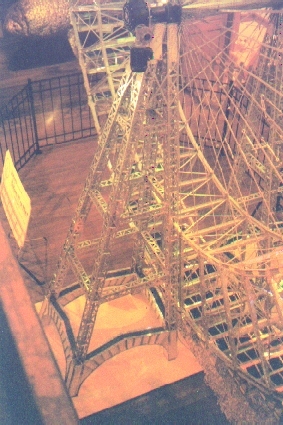 After being displayed in New York the model was dismantled and shipped to Florida where it can still be viewed. The perforated strips that make up the spokes, shown in this photograph, have been replaced with quarter inch axle rods. This was necessary to stop the model sagging under its own weight. 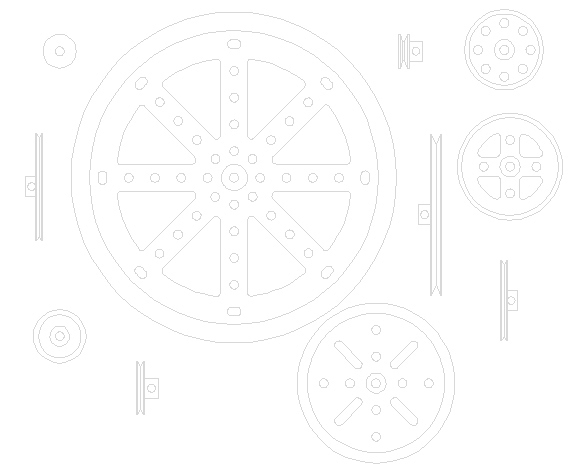 Click here to view parts commonly used in Erector sets to build a ferris wheel. It is a magnificent model and is the central display item for the St. Augustine Ripley's Believe it or Not Museum. Right: A view of one of the gondolas or "cars". All 36 are identical. The doors can be opened and they are well detailed. If background music has not started after this page has loaded, click here.